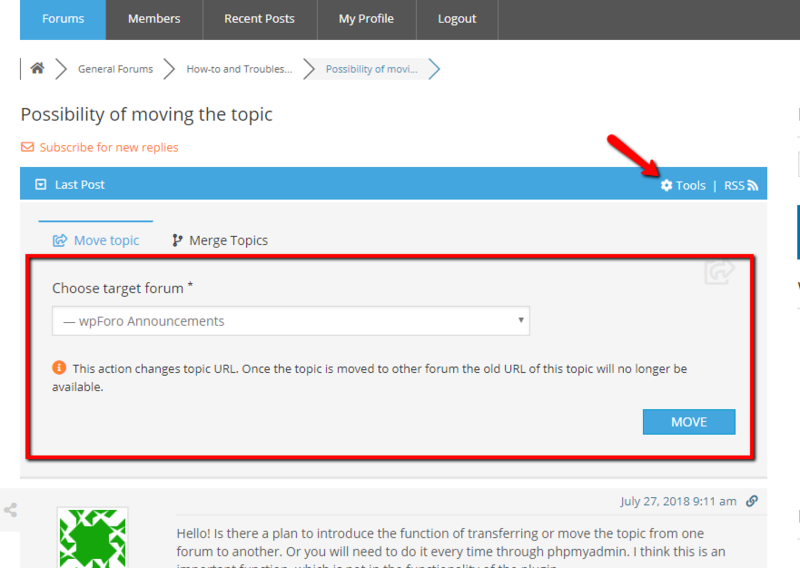 Move a discussion to another forum? I have a discussion in one Forum that I want to move to another forum. Is this possible? I don't see an option for it anywhere. Maybe I'm missing something. In case you'll have some other question related to wpForo, please open a new topic in wpForo.com community. Here we mostly support the questions related to wpForo addons. Okay the link isn’t what im looking for. I’m not moving topics from site to site. I guess it would be Categories (Blue Panels) I want to move a topic to a new blue panel category. There are "Move topic" and the "Move reply" options for this purpose. The options are located in the upper right corner (Tools), as shown in the screenshot. Here you can manage the target forum and target topic URL and so on. Hmm. That’s not showing up on my screen and I’m admin of the site?! I thought it was there before but it’s not there now. Is it possible is turned something off? This only exists in the top blue panel of topic page, the page where posts are listed not topics. make sure you've clicked in on topic title and entered in a topic before checking it n top. Also make sure you have an Admin Usergroup in Dashboard > Users > Your Profile admin page, just scroll down and find Forum Usergroup option and check it. This is not the same WordPress User Role. This si a different option.